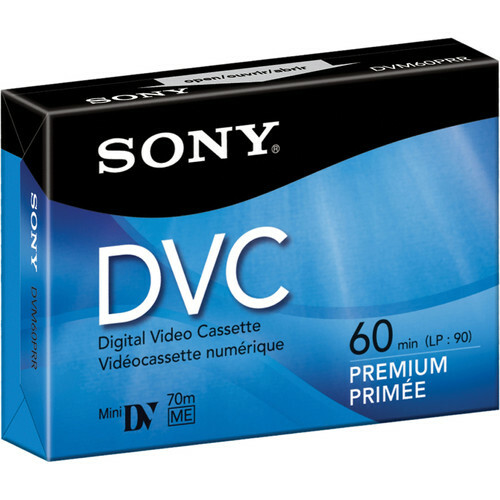 The Sony DVM-60PRR 60 Minute Premium Mini DV Video Cassette is made for DVC camcorders. The tape features Metal Evaporated tape, a diamond-like carbon coating protective layer, which improves durability, and helps prevent shedding and drop out. Mini DV metal evaporated tape made for DVC camcorders. Diamond-like carbon protective layer improves durability and helps prevent shedding and drop out. Box Dimensions (LxWxH) 2.835 x 2.047 x 0.551"
DVM-60PRR Premium MiniDV Cassette (60 Minute) is rated 4.7 out of 5 by 440. Rated 4 out of 5 by Terry the frenchman from Perfect tape for budget This Sony tape is the perfect all around tool for many uses, pro and amateur alike. I only use them in my Sony camcorders and have never experienced any drop out or any type of problems. I've probably used an average of 30 tapes a year for the past 5 years. I never erase or reuse them as most of my tapes end-up as archives that I don't touch once it's downloaded onto my editing station. The price especially with quantity discount makes it very attractive. The picture quality will of course depend on your camcorder but with a sensitive gear, the pictures will be stunningly beautiful. I have not yet used this tape in HDV camcorder, but I will give it a try. Rated 5 out of 5 by James the Sawmill Videographer from Always works...always great quality!! Being a videographer for an industrial product company I have to film everything; meetings, tutorials, products, etc. And I shoot in every way from a simple point and shoot quick thing to a full on production set up with lights and the works. I always get these tapes and they never let me down. I'm not always right by my studio and I can't take a tons of backup tapes so I need to rely on tapes that work the first time without any hitches, so far these haven't failed me yet. I film in HD for most things and the quality is true from tape to tape and even when I reuse a tape on the rare occasion. Nothing bad to say...quality tapes that always work and perform great. Rated 5 out of 5 by Coach Bob from Always dependable We have used 50 or more of these tapes every year for the last 3 to 4 years, and have yet to have a problem. We have a Sony HD camcorder, and tape dozens of youth Football games for the year-end highlight video. We also tape many plays and various musical performances with them, for our own kids and for our friends. The video output quality from these tapes looks great on our Sharp HD TVs. I am not normally a big fan of Sony products, except for their camcorders and tapes. Their other product lines tend to be good but are often overpriced, but these tapes can't be beat for price and reliability. I have tried other brands, but I won't use any other tape for our HD camcorder. Rated 5 out of 5 by lilafilms from I swear by this tape stock I have used this tape stock for at least 10 years - with a Sony TRV 900, a Sony PD150, a Sony Z1U and a Canon Vixia, and knock on wood, I have yet to see any dropouts or have it gunk up my tape heads on any of these cameras. I wear tape pretty hard - I check it a lot as I am shooting, and I batch digitize, so it gets rewound a lot, and it remains tight and crisp and holds up well over time. I have used this tape in steaming humidity and in the desert, over 10,000 feet and in an underwater camera, and it seems pretty bomber to me. Rated 5 out of 5 by Anonymous from What a great sony product 5++++++++++++ This must be the most reliable tape that I have ever used in the professional wedding videography, very rear it will drop a frame like most of the others that we have used, not to mention any names but they charge through the roof for the Sony tapes and always had problems. Now since we have been using these tapes, we hardly experience any frame drops like the expensive rubbish you can bye. It will out do any HDV and DVcam tapes any day as we have spent loads of money on very expensive tapes not to have problems and have someone tell us to service the heads even though It doesn't need it and now we know that it was always the tape. Still using the same video cameras as well. Great product guys, keep it going. Rated 5 out of 5 by jfish from Cheap and no quality difference Have gone through hundreds of these tapes without any problems or even a dropped frame. I have used the pro level tapes Sony has, and have never been able to distinguish a difference in video quality. That might be more related to my camera and monitor but I highly doubt it. Paying three times as much for a tape for a 5% improvement in video quality is not justifiable based on what I do. (I go out and shoot everything I can. Events, nature, short films, you name it).If you need that peace of mind, go and pay the extra $4 a tape. Will keep using these until I have a problem. Rated 5 out of 5 by Anonymous from Awesome Tapes I bought these tapes to use with my Canon HV-30 instead of spending the extra $4 or so per tape on HDV tapes, and it was one of the better decisions that I've made. The tapes are awesome - I've already run through about 3 or 4 tapes and I haven't had one glitch or dropout yet. As every professional will recommend, don't mix tapes (don't use these and then use another brand - the oils will clog up your deck). Once you use them, stick with the same tape (or at least stick with Sony). They were the first tape I used with my HV-30, and I'll stick with them. Rated 5 out of 5 by Kira M. from Fantastic quality AND price!!! I've been using Sony tapes for about 3 years now and I haven't encountered a problem yet! I'm a videographer and have used it in so many cameras (JVC's newest HD cam, Canon PD-150, Sony HDV-Z1U, Panasonic PV-GS150, Canon GL1 and GL2) without any problem. The tapes are cheap (price wise), reliable, and I've never had a dropped frame when capturing or a fuzzy picture (that wasn't the camera's fault), any degraded pictures, or really any problem. I've dropped them from heights, traveled with them, slung them around, basically put them through hell and they've survived. The only thing that breaks is the case. I've used other types of tapes (JVC and Panasonic and even Fuji) but keep coming back to Sony because they are the best. Is there any camcorder still using mini. DV cassette available in B&amp;H? Yes, a sony camera. We have a newer digital camera, so the older one is not used nearly as much. Does anyone know where to find the adapter for mini dv to vcr tape? My camera's firewire output no longer works. Does anyone know of a another way to get footage from these tapes onto a mac? Like a tape deck or some sort of player/reader. I feel your pain. What I have done to solve this problem is to buy a good condition little/inexpensive camera that to use as a tape deck. Wish you the best. how can I convert this tape format to a dvd format? If you are using a Mac, you will need either USB or FireWire cable to connect camcorder to your Mac. Open a video software, like iDVD, iMovie, or Final Cut Pro. You will batch capture your film into the Mac's HD. Once the film has been batch captured, you will make a QuickTime Movie File of your film. Once you have created a QuickTime Movie File, you can burn your film to DVD by using iDVD, or DVD Studio Pro.If you have a Windows PC, you will need a software called Windows Movie Maker . You capture your film, and create a Windows Movie File. Once you have a Windows Movie File, you can burn to a DVD disc, or even better, copy and paste into an USB flash drive. Hope these tips make sense.